Aquila is a solo-outfit by Atheosoph, whom you might know from his collaboration in (sadly defunct) Rein (review for their sole album La Cocaïne Des Seigneurs: see update of March 5th 2016). Under the Aquila-moniker, Atheosoph recorded a first demo-tape, Les Larmes De L’Aigle (‘tears of the eagle’), which was released in a limited edition in September 2014 via Werewolf Promotion. The very same label did release the untitled split-tape with Aquila, Charogne and Veratyr (June 2015). Werewolf Promotion and Hass Weg Productions decided to join forces once again (they co-released Gnieu’s last album last year; it will be reviewed in a couple of days / weeks / centuries as well) in order to release L’Aurore (‘the dawn’) on CD. The album, which lasts for fifty-seven minutes, consists of all tracks from Les Larmes De L’Aigle (three pieces) and the split (four titles), as well as one new (?) composition, Neiges Mortes (‘dead snows’). There are (were!) 500 copies, which come with quite sober artwork (yet a beautiful cover for sure!). With this album, Aquila perform a very dark and epic, even mystic form of Black Metal. L’Aurore comes with an overwhelmingly powerful sound, caused by the ‘full’ instrumentation. All tracks are like what some might label as ‘monolithic’, being done with a surpressing, monumental approach. The material itself is not necessarily ultra-brutal or aggressive at all. No, L’Aurore rather focuses on the intensity of atmosphere. But with that ‘monumental approach’, I’m referring especially to the fierce execution and the grandiose production. In general, the main tempo is quite mid-oriented, even slow-paced, with a handful of faster outbursts. It just strengthens the majestic identity of Aquila. Once again I propose to let the Music do the talking. I promise you, dear reader, that this release is a superb event. No, it does not renew, nor is it enthralling in a sense of adventurous progression. 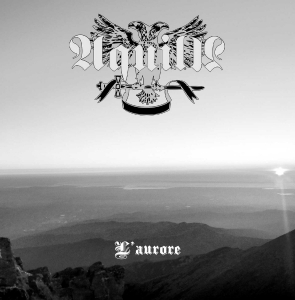 L’Aurore, however, is a monster of an album, totally dwelling within the tradition of the more atmospheric-epic scene, and absolutely superior when focusing on the qualitative aspects of the genre. Not once there is a fall-back (translation: a minor element of inferiority), contrasting fiercely with the fine highlights, being not-to-underestimate details all around – cf. the acoustic intermezzo Imperium Europa, for example, or the magisterial tempo changes in several tracks on the first half of the album. This slow-paced yet overwhelming Atmospheric Black Metal will surely convince, well, people like undersigned, not caring about trends, but focusing on the essence of the scene! In my opinion: mission accomplished!